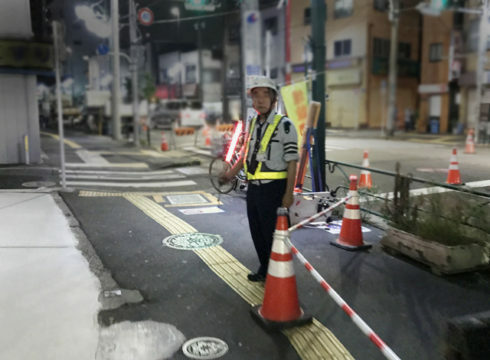 A man working the late night shift in Minato Ward, Tokyo, last night has rescued a pedestrian from certain death whilst wielding some kind of glowing baton. “Last shift, I forgot my lightsaber, and at least 13 humans perished,” said Kintaro Sasaki. According to local sources, Sasaki ultimately guided countless people around a few traffic cones surrounding a massive deathtrap about 40-centimeters deep. “I would have fallen straight down into that pit of hell if it wasn’t for Sasaki and his awesome orange glow stick,” said 27-year-old survivor Yuki Tachibana. Only one man on duty? For a 40cm deep hole!? Standards are slipping dangerously! That sort of situation requires a four man team at the very least. This is fake news – anyone in Japan knows there should be a minimum of 100 cones for any hazard (preferably with some cute giraffe barriers). Shame I cannot post photos of the real deathtraps of Japan.